Max Miedinger is a Swiss typeface designer most importantly known for his Neue Haas Grotesk typeface in 1957 which was later renamed Helvetica in 1960. Helvetic is a sans serif font. I never knew how much love there was for Helvetica until i signed up for Pinterest today. Miedinger’s Helvetica was redesigned and released in 1983 as Helvetica Neue by Linotype. I had Helvetica Neue for Project 2 Font Mannerisms and I wasn’t impressed, but after the Project 6 book exercise I have a new appreciation for the font. Very influential graphic designer and typeface designer. I picked a couple of Lubalin’s works from the Megg’s textbook for my visual analysis and I think his typefaces are amazing. He isn’t afraid to push the boundaries of text and he isn’t concerned with the legibility when he’s creating. I think that’s very inspiring since I’m the opposite and hold back. Avant Garde Gothic shows tight kerning, over lapping ligatures and a very distinctive style. He wasn’t afraid to go crazy and really explore the limits of type and phototype. P22 is a Type Foundry in Buffalo, NY. Their website takes the wood type catchwords created by The Hamilton Manufacturing Co. and digitalizes. This poster caught my eye because it’s the same company in the movie we watched in the open studio. I think it’s interesting that there’s someone who is making and selling New Wood Type Catchwords and P22’s Behance page has a link. Created at Loomis Group, San Francisco. I think it’s a very clever arrangement of the text inside the bowl and counter and the use of “original gangsta” for serif typography. The information about all the important texts or products that use Garamond is also very interesting and something i never think about. 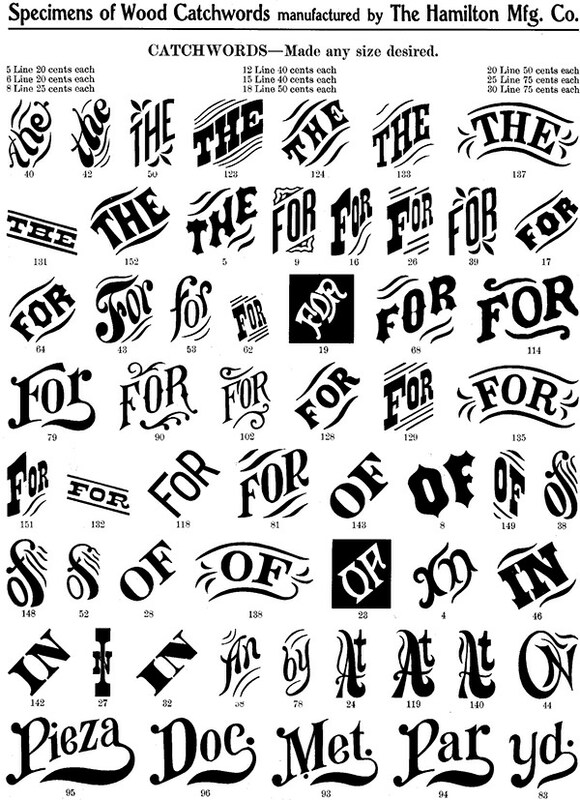 A-Z glossary of the Anatomy of type. This website was extremely helpful when I need to understand the difference between two parts who’s descriptions were similar. An example was eye and counter. Some diagrams show the lower case ‘e’ having a counter and others showed it having and eye. Because this glossary was alphabetical I could look them both up and find out the difference. A curved stroke that is continuous with a straight stem. The invisible line marking the height of ascenders in a font. The invisible line marking the farthest distance between the baseline and the top of the glyph. Teo Gagliano’s letterforms are really creative and have a nature theme throughout all the letters. This is similar to what we created in Project 4, but taking it a step further and creating the whole alphabet. This project has definitely been a learning curve for me, especially in the early stages of adjusting the columns with soft returns and kerning. The assignments was by no means “hard” but it was one of the hardest assignments for me because it was so tedious, time consuming and new. Looking back from my In Design file Project6 PartB.2 to Project6 PartB THE_Final shows how much I’ve learned through out this process. I can see now how hanging letters like “I, as, to, of, a” are very distracting when they are hanging at the end of a line in a column of text. I had never paid attention to typography like that before and it does make a visual difference when you soft return them down a line. However, at certain point sizes this soft return can create a huge, awkward hole in your paragraph that you have to compensate by kerning – or +. Sometimes that was impossible for me because my hanging letters were often followed by long words that could not be kerned with the line above. Smaller point sizes were easier to make changes because the original kerning was tighter allowing for an “a” or “I” to move down without creating as much of a gap as the larger point sizes, but it also made kerning harder because -20 kerning of 8 point font is much more noticeable than -20 at size 16. Therefore, i wasn’t able to kern smaller size fonts as easily as larger. If I had a widow of “Q” in size 16, -20 kerning often brought the “Q” to the above line with no problem. If I tried this with 6,8,10 point fonts the kerning took -30 or more to bring the widow up which is unacceptable kerning for such a small font. Below is my original layout before any corrections were made. You can see all the widows and how much they stick out. Even my “and Q’s” were widows i had to adjust. I learned that in order to not be a widow the last line must be at least 1/3 the width of the column. I found myself correcting my graphic design Visual Interpretation Poster after i started project 6 because I was arranging my layout in a grid with 300-500 words of text. The knowledge I acquired from this assignment made my assignment for graphic design better. Last semester in my Intro to Software class Andrea Cardinal mentioned about not double spacing after a period. I had been taught in K-12 to always double space after a period and have been doing so ever since. However, once Andrea brought up that it’s now a no-no I’ve been very careful not to in my writing. It has been a very hard habit to break. Oddly enough at the beginning of this semester I came across this article on facebook about typography and how its history demonstrates the once “needed” double space for type and how it is not needed with present day technology. *Correction, Jan. 18, 2011: This article originally asserted that—in a series of emails described as “overwrought, self-important, and dorky”—WikiLeaks founder Julian Assange used two spaces after every period. Assange actually used a monospace font, which made the text of his emails appear loose and uneven. Allibanana on Project4 PartB layout- Too crazy?